Thomas Jefferson High School for Science and Technology junior Prathik Naidu, 17, already has a great deal of accomplishments under his belt. In middle school, Prathik developed a passion for computational biology and began writing computer programs to understand biological data. To learn more about this field, he spent two summers at Johns Hopkins University where he worked on projects ranging from developing algorithms to study genetic differences in ethnicities to simulating antimicrobial peptides using a supercomputer. Prathik has presented his research at international conferences, won the grand prize at the Fairfax County Public Schools Science Fair and was a finalist at the Intel International Science and Engineering Fair. He is one of 52 students nationwide selected to participate in the MIT’s Research Science Institute summer internship program. Prathik’s interest in computational biology with applications in medicine led him to organize and establish the first Youth Bioinformatics Symposium at George Mason University in collaboration with the International Society for Computational Biology. The conference introduced metro D.C. area middle and high school students to integrating computer science and biology via workshops and science fair. 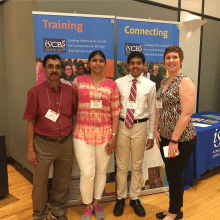 Prathik plans to work closely with ISCB to organize more conferences and hands-on workshops across the country to build a national platform for encouraging youth to learn more about the growing importance of computational biology. Prathik has also carried his interest in computer science and biology into the field of digital humanities, having applied his computational biology knowledge techniques to analyzing historic artifacts and pieces of literature. As the founder of The Classics Project, an organization aimed at promoting classics at a young age and conducting digital humanities research, Prathik has collaborated with professors at Dartmouth and Harvard to build image detection algorithms that allows researchers to quickly analyze classical inscriptions. In the future, Prathik hopes to pursue a career that combines his interests in computer science, biology and entrepreneurship.